Dogs are living creatures and there behaviours naturally change over time due to factors like age and changes in their environment. Any guarantee in these Terms and Conditions cannot circumvent these factors. These terms and conditions apply to all sales and services by Jackie Murphy, Specialist Dog Training to the exclusion of any other terms unless otherwise agreed in writing. They reserve the right to update these Terms and Conditions at any time by notice and with immediate effect. By booking one of Specialist Dog Training’s services, you are agreeing to these Terms and Conditions. Once booked and paid for there is no refund available. Specialist Dog Training reserves the right to cancel or change an appointment at any time by notice with immediate effect, without cause. By booking you will agree to keep the date and time of the consultations. If changes to the date and/or time need to altered by you, then a 48 hour notice needs to given, otherwise a charge of £20 will be incurred on top of the existing consultation fee. By placing an order you agree to these Terms and Conditions which form the only agreement between us. Jackie Murphy reserves the right to make changes to the items shown on this website and to remove styles and goods. We will normally deliver goods within 5-10 working days subject to the goods being in stock. If there is going to be a delay for any reason we will advise you. We will not be liable for any consequential loss caused by failure of the carrier to deliver. The price of the goods will be the price ruling at the date of order. All prices quoted include post & packing and VAT. We will do our utmost to ensure that we deal with you in a safe way. Our computer systems are protected by a firewall that is designed to prevent unlawful access to our computer held records. We cannot, however, guarantee that such an event will not occur and will not accept any liability of any loss thus caused. Our anti-virus software scans all emails before transmission but we cannot be held responsible for any damage or loss arising from such an event occurring. We will not share or make available the information we hold on our database with any other company or organisation unless under court order. All images used on this website are the property of Jackie Murphy, Specialist Dog Training and may not be copied or reproduced without the written permission of Jackie Murphy. 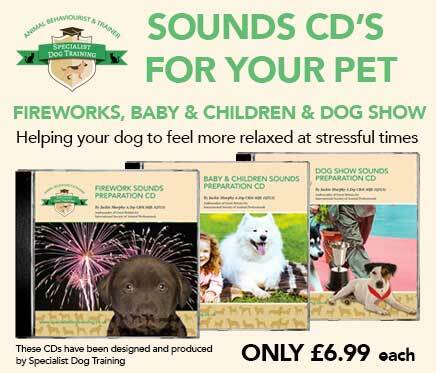 The information on this site is copyright of Jackie Murphy, Specialist Dog Training. The use of this site and its contents is prohibited without our written agreement. Trade marks and names included in this site are owned by us or our suppliers and should not be used in a way that infringes on their holders rights. Work or works means behaviour consultation, training, handouts, written report, behaviour program, training program created by Specialist Dog Training. It may also describe other services such as administrative, training meetings and other tasks which are necessary in the creation of the program. Specialist Dog Training means Specialist Dog Training and it can also extend to Jackie Murphy. The Client means the individual who requested the work. These terms and conditions shall prevail over all terms and conditions of your customary practice or any previous course of dealings the client has had with Specialist Dog Training. These terms and conditions apply to all work created by Specialist Dog Training. Work services or products are only supplied in strict accordance with these terms and conditions. The contents contained in the quotation (verbal or written) and these Terms and Conditions form the agreement between Specialist Dog Training and the Client relating to the work, no variation on them will be binding to Specialist Dog Training unless it is agreed in writing and signed by Specialist Dog Training (Jackie Murphy). Should Specialist Dog Training decide to waive any of these terms on an individual basis, this shall not affect the validity of remaining clauses or commit Specialist Dog Training to waive the same clause on any other occasion. Ordering services or using work created by Specialist Dog Training is automatically agreeing to these terms and conditions. Specialist Dog Training shall create the agreed work for the use of the client. The client may use the work or works only in its original form and only for its original use for the animal named and described within the work. Specialist Dog Training shall create work to the specifications of the problems assessed and will make amendments to the work accordingly. Work created by Specialist Dog Training can only be used for additional uses if agreed by Specialist Dog Training in writing and signed by Jackie Murphy. The client shall agree not to sell, destroy, deface, alter or part with work created by Specialist Dog Training or permit it to be done so by a third party. Work created by Specialist Dog Training is charged to the client at the agreed amount. The full charge of the service is payable at the main consultation. Deadlines set in the agreement will not affect Specialist Dog Training’s right to be paid. If work is cancelled the client shall reimburse Specialist Dog Training for any and all losses arising. In the event that work is cancelled ownership of the work remains the property of Specialist Dog Training and the Client is not authorised to use any part of the work. Ownership of the work shall not pass to the client until all charges have been paid in full. All work created by Specialist Dog Training for the client is to be used for the soul purpose for which it was created. The client does not have the right to resell work created by Specialist Dog Training or repurpose it without written consent from Specialist Dog Training. Specialist Dog Training is entitled to assign any or all of its rights and obligations included in this agreement to sub-contractors. Specialist Dog Training will not be responsible for the creation of work which in any way contravene any existing Legislation and in particular the Trade Description Act 1968 and the Consumer Credit Act 1974. Specialist Dog Training reserves the right to refuse to provide service or create work at its own discretion. Specialist Dog Training cannot always guarantee to start work immediately. If no timescale has been agreed for a service Specialist Dog Training will not be responsible for any losses to the client if deadline is not met. All amendments must be agreed by both Specialist Dog Training and the client. Amendments may exceed original deadlines agreed by Specialist Dog Training and the client. The client shall pay Specialist Dog Training the full price of the service at the first consultation/training session. Specialist Dog Training expects payment by cheque, electronic bank transfer or cash. Interest will be charged per day on all payments received outside of payment terms at the rate of eight per cent above the Bank of England Base Rate as applicable on the previous 31 December or 30 June whichever is the most recent. Whilst outstanding payment is due Specialist Dog Training reserves the right to withhold the designs services or goods. In case collection proves necessary, the client agrees to pay all fees (including all legal fees and court costs) incurred by that process. If for any reason whatsoever Specialist Dog Training are unable to provide an agreed product or service in accordance with these terms and conditions our liability shall be limited in its entirety to a proportional refund of any fees paid by you for the service or product. If the client fails to pay which has become overdue. If Specialist Dog Training discovers that the client’s use of work produced is unethical misleading or morally corrupt. If the client’s use is in anyway harmful to Specialist Dog Training or its reputation. A service will be deemed as cancelled if there is more than 30 days from the first training or consultation. Specialist Dog Training shall have no liability under any circumstance whatsoever to the client for financial loss or loss of profit. Specialist Dog Training will not be held responsible under any circumstances whatsoever to the Client for a lack of time, effort and circumstances from the work. In no event will Specialist Dog Training be liable to the client or any third party for damages or losses. Specialist Dog Training will not be liable for any loss, injury or liability to the client. Specialist Dog Training’s preferred method of communication is by email. However documents can be sent by traditional post, if no email address is available. Specialist Dog Training shall not be held responsible for spelling mistakes or typing errors to any documents. All material, both text and images included in documents are the property of Specialist Dog Training. Specialist Dog Training holds copyright of all work created. The client must have the right to share any information, which it submits to be included in any work created by Specialist Dog Training. Information which involves the collection and administration of personal data the client is deemed to be the Data Controller and as such is responsible for notification under the terms of the Data Protection Acts and related regulations. Specialist Dog Training will take no liability for any issues arising from Data Protection Acts. The information and any treatment suggested consists of Specialist Dog Training’s personal views and are based on the information given to Specialist Dog Training by the client or person responsible for the animal(s) and or Specialist Dog Training’s own conclusions resulting from personally gained evidence of the animal and the related behavioural problem. Treatment plans for the most part will not be successful overnight. This requires a good deal of patience. Specialist Dog Training cannot guarantee that this will work, as each animal is an individual case, nor is it possible to foresee if another problem may arise as a result of the treatment. All programs are specific to a certain animal and should not be tried on any other pet, only the animal whose name that appears on the information. Specialist Dog Training encourages clients to contact their veterinary surgeon prior to putting the actions into effect, if they are concerned. By booking one of Specialist Dog Training’s services, you are agreeing to these Terms and Conditions. Once booked and paid for, there is no refund available. Specialist Dog Training reserves the right to cancel or change an appointment at any time by notice with immediate effect, without cause. By booking you will agree to keep the date and time of the consultations. If changes to the date and/or time need to be altered by you, then 48 hours notice will need to be given, otherwise a charge of £20 will be incurred on top of the existing consultation fee.